Donkey was right of course, parfaits really are delicious. The Monkeys were watching Shrek one rainy weekend recently and I was in the kitchen wondering what inspiration was going to fall upon me for the container of sprouted mung beans on the bench. I kept mentally adding ingredients to my bowl but I was also furrowing my brow a little at the same time as quite frankly, sprouted mung beans, honey and yogurt… I really wasn’t sure about it. What the hell. I started to construct, pulled out a spoon, and tentatively tasted. Yep… Yep, I think that works. Even works quite well. I made it again several days later and then again just to make sure my taste buds weren’t playing tricks on me. Mung beans, honey and yogurt DOES work in a parfait like kind of fashion, and I would even go as far as saying… it’s delicious. * I found some locally grown sunflower kernels recently at Newcastle Farmers Markets– I can’t tell you how happy I was to find this, as up until now all I had found was imported. Very happy! This entry was posted in Connecting with Community, Food Glorious Food and tagged breakfast, healthy, high protein, linseed, parfait, raw, snack, sprouted mung beans, sunflower kernals, the urban beehive, vegetarian, whole foods, yogurt by cityhippyfarmgirl. Bookmark the permalink. Mung bean parfait? You truly are the ultimate hippy chick, Brydie! 🙂 It does look very pretty! ha! 🙂 Got to live up to the blog title Celia. He made me promise not to hide my little mungie beanies under salad leaves or in omelets or under his pillow. He claims not to like them. Hmmmm! Girl, you are so much more kitchen-creative than I!! 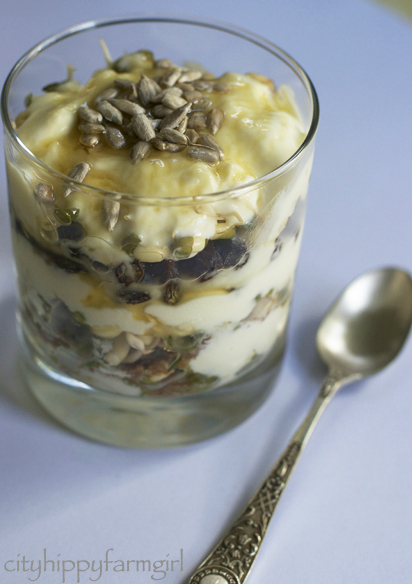 I would’ve never thought to put mung beans in a parfait! I really only love parfait for the fruit – not sure about mung beans instead of fruit – I would try it but I know some who wouldn’t (I live with someone who just doesn’t get these sort of sprouts) but I do love that you are inspired for your meals by Donkey in shrek! Hehe… Donkey inspired parfait and waffles. Sprouted mung bean waffles next?? Wow, now this is a combo I wouldn’t have thought would have worked! But I’m sure you’re right, I mean why wouldn’t it really? Now that is not something I’ve ever considered…but I’m happy to take your word for it and notch them up as something to try 🙂 They do look gorgeous, that is for sure. Talk about being creative. If someone was blindfolded, I bet they would never guess the ingredients but would say it was good. looks so pretty brydie..like a few other commenters i would never have thought to put sprouting things in a parfait but now that you mention it..well..why not? Great idea indeed, terrific use of ingredients Brydie!